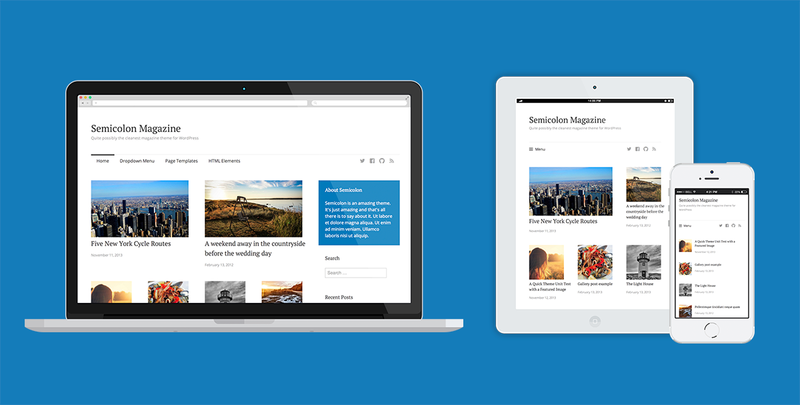 Semicolon is a brand new magazine theme for WordPress. It’s simple, clean, and it’s got quite a unique grid layout with support for featured posts. Semicolon was initially created for WP Magazine, an online news site about WordPress in Russian. It’s got support for featured posts, a social profiles menu, related posts, author bios, and a few widget areas. Head over to the demo to take a look around. The latest version is always available for download on WordPress.org (don’t forget to rate it! ), and if you ever get stuck, please visit the the FAQ and the support forums. Semicolon is based on the amazing _s starter theme, and is distributed for free under the GNU GPL. Enjoy! Posted on June 3, 2014 by Konstantin Kovshenin. This entry was tagged themes, WordPress. Bookmark the permalink. ← Knock knock! Who’s there? … 1Password. Another beautiful theme, Konstantin. I can’t wait until a suitable project comes along so I can give it a whirl. this is really my fav theme for my website update. Is it possible to get submenus as dropdowns in the main menu ?